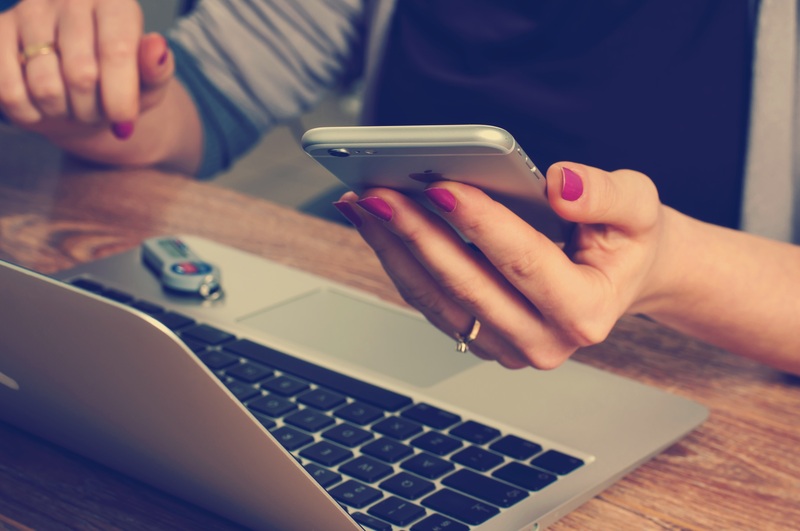 What Is the Difference Between Outsourcing and Out-tasking? Not clear about the difference between outsourcing and out-tasking? Not sure which strategy makes the most sense for your business? Organizations are often unclear about the differences between IT outsourcing and IT out-tasking. They commonly use the terminology interchangeably even though they are very different strategies with different implementation timeline and complexity. Out-tasking sits on the services spectrum between contracting and outsourcing. Out-tasking helps organizations to quickly augment full-time labor capacity within the current operating model without adding headcount. This approach is more organized and measured than staff augmentation and is much easier to implement than outsourcing. However, there are some key differences to factor in when considering traditional outsourcing versus out-tasking. Most companies are familiar with traditional IT outsourcing practices – moving the people, process, tools, and management of an IT service tower to an external service provider for a monthly or annual fee. Often the provider has captured best practices (secret sauce) within their toolset, processes, and training to deliver a superior service at a lower cost. The provider takes on a responsibility to manage the process. This allows organizations to focus on core business competencies without having to manage or build a large internal IT department. Within an out-tasking arrangement, the client retains their tools, processes, and management staff. The provider supplies all the labor resources and provides the flexibility of scaling up and down, as needed by the client. This strategy allows companies to add an additional resource or area of expertise while still maintaining control over IT management internally. 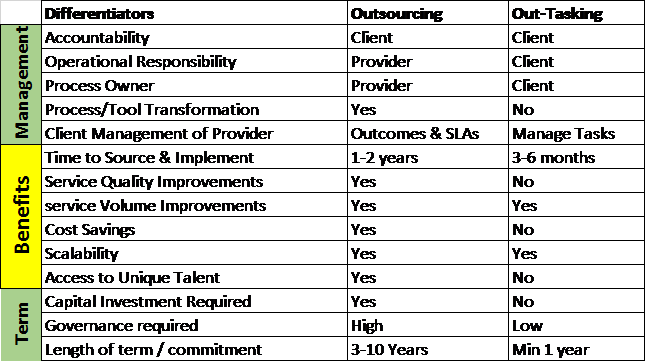 Top Line Growth over Bottom-Line Savings: Outsourcing is a major commitment of money, resources, and management attention for 2-3 years to achieve a long-term benefit over the next 10+ years. If the client organization is small-medium and growing at an uncertain rate, it is unlikely to pursue outsourcing. In this environment, the client wants to grow and scale to handle top-line growth with variable expenses, not fixed. In contrast, outsourcing is about stable, predictable service model, forecasted volumes and predictable lower costs over a longer term. Unlimited Flexibility and Scalability is Essential: Outsourcing is a longer-term commitment with capital investments that require a fixed commitment with a measure of scale up and down within a tolerance band. Out-tasking has minimal up-front investment and can be scaled up and down with virtually no constraints. Too many contractors in a client function with no measurements: If the client already has a pool of independent contracts, an out-tasking provider is likely a better solution. Out-tasking providers will take on the responsibility to manage the resource replacement, recruiting funnel, onboarding, training and off-boarding, as well as the performance and productivity reporting. Outsourcing is not the answer for every client situation. Out-tasking can be a very effective targeted solution that can be sourced and implemented in 3-6 months to achieve high flexibility to support client growth during uncertain times without large capital investments. R3P helps our clients formulate and articulate a “sourcing strategy” with a clear understanding of the business goals, requirements, constraints and timeline to achievement. Repatriation, outsourcing, offshoring, out-tasking, robotic automation, captive centers, offshoring, and joint-ventures are all considerations when developing a sourcing strategy.